The much-loved orchid is a member of the family Orchidaceae, the second largest family of flowering plants, consisting of over 20,000 species! 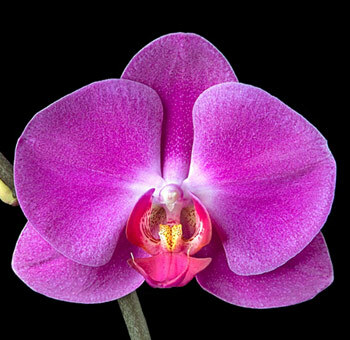 In addition, commercial producers of orchids have developed over 100,000 horticultural varieties. The species that people are most familiar with is Phalaenopsis, pictured on the right. The number of spectacular colours and patterns that are available in this species is endless. Deep purples, mottled white and purple, yellows with delicate pink centers, and pinks of every shade, to name a few. Mass production techniques have resulted in very reasonable prices and widespread availability of orchids. With proper care, the flowers on orchid plants can last from weeks to months, making orchids a great alternative to cut flowers. Mini phalaenopsis are under $10 and quickly liven up an office workstation. Several other spectacular species are gaining in popularity. Dendrobium orchids have smaller, very intricate and more abundant flowers. They are also available in many colours. Cymbidium orchids also have clusters of small delicate flowers. Did you know that many species of orchid are native to Ontario and grow as wildflowers? The most familiar of these would be the Lady Slipper. We are frequently asked about the care of orchids. Many people are concerned that caring for an orchid is tricky. It is actually very straighforward, with one key trick… do not overwater! Orchids need infrequent and small amounts of water. The equivalent of a melted ice cube every few days is enough. Orchids are typically packaged for sale without soil. The roots are surrounded by small chunks of wood mulch, which hold moisture. Keeping these wood chips slightly damp provides all the moisture needed for potted orchids. Orchids purchased from quality suppliers should keep their flowers for several weeks to several months. Bright indirect light helps prolong the flowering period.